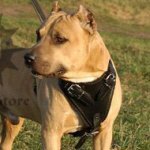 It`s necessary to start training your Staffy puppy from the initial weeks you got it to avoid the problems of misbehaviour in future. 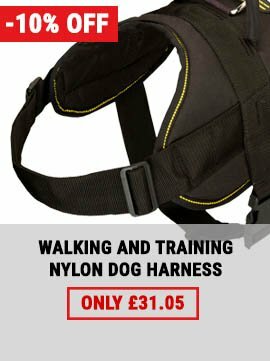 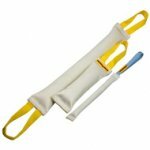 How to train a puppy to a dog lead and a dog collar? 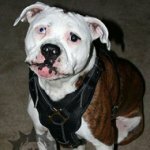 Many inexperienced Staffy breeders are bothered with this question. 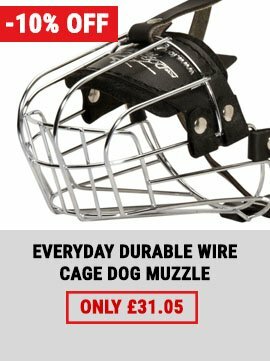 The younger Staffy is, the easier and faster it will get used to these dog accessories. 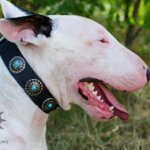 You need to be patient and persistent, then the success will be ensured. 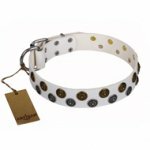 The first trying on of the dog collar should be done in a few days after you brought Staffy puppy home. 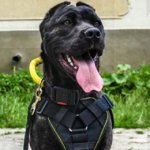 When you will understand that Staffy is got used to you and is adapted to new environment, get Staffy collar and dog training lead and acquaint the dog with new pet accessories. 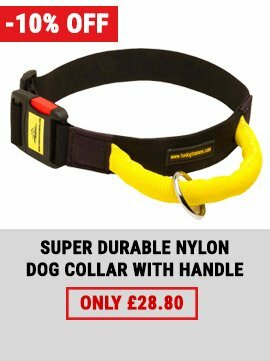 Stroke your Staffy puppy tenderly, praise it and let it to sniff the dog training collar. 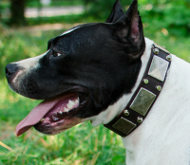 Put the dog collar on your Staffy while distracting its attention with a dog game or a dog delicacy. 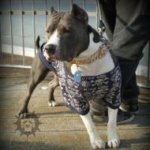 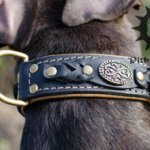 How to accustom Staffy puppy to a dog collar? 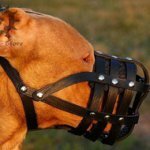 More than likely Staffy wouldn't like that it was limited in freedom of movements, it will hang out and try to take off the dog collar with paws. 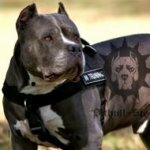 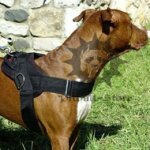 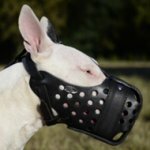 Staffy breeder should form in the dog pleasant psychological associations connected with wearing a new dog accessory. 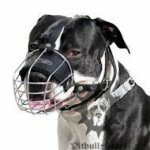 After you will put the dog collar on Staffy, feed the puppy and go for a walk at once. 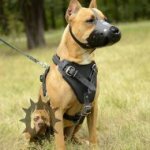 Do it like that each time, then your Staffy will like to put on the dog walking collar and won`t try to take it off because it would be fed and walked after that. 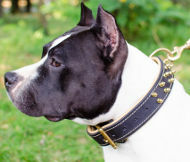 You will understand that Staffy is accustomed to the dog collar of its behaviour: the puppy quietly allows to put on the dog collar, doesn't try to take it off. 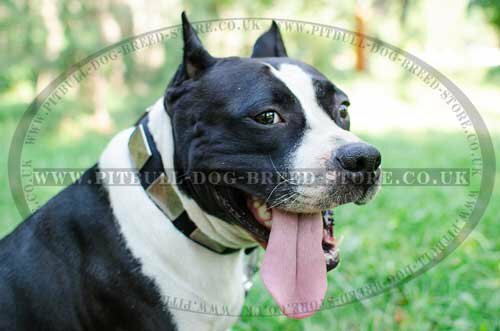 Staffy should be accustomed to the dog lead after the training dog collar. 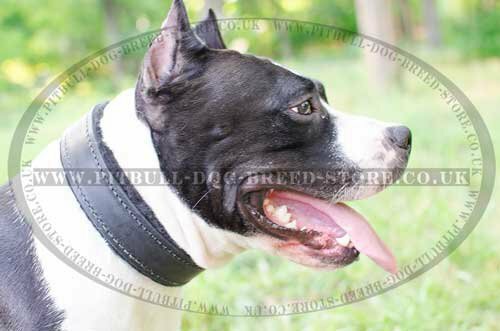 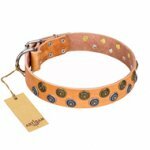 Suitable dog collars for Staffy, click on the pictures! 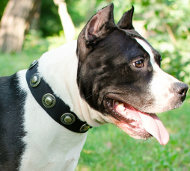 Read also how to accustom Staffy Puppy to a dog leash.